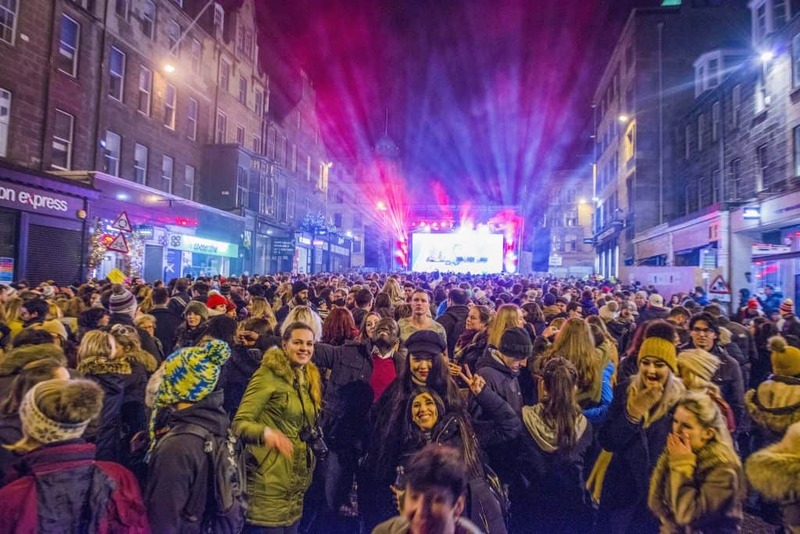 It was our second time to Scotland’s capital and for good reason, Edinburgh’s Hogmanay. Edinburgh is well known for their festivals and we had just missed The Fringe, the largest art festival in the world on our first visit. So, when we had the chance to return to celebrate another New Year in one of our favorite cities we couldn’t say no. 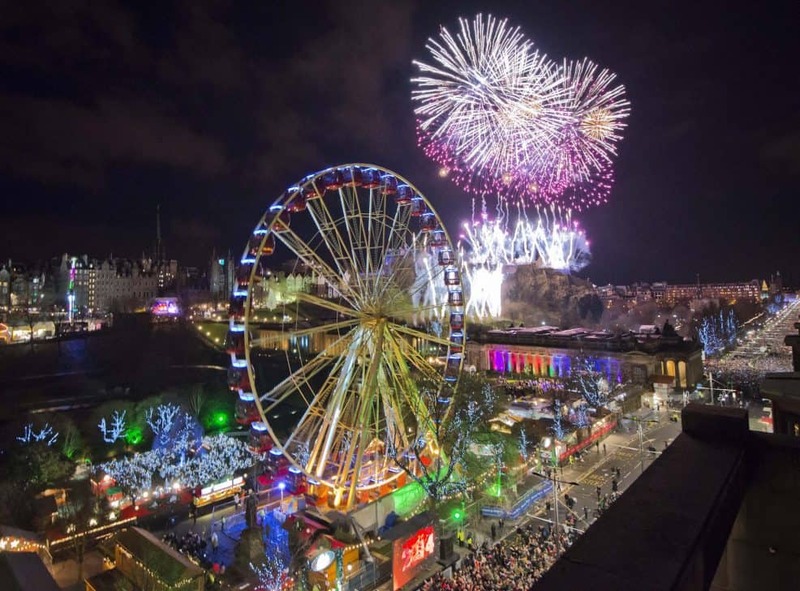 In case you’re curious “Hogmanay” is a Scots word for New Year’s Day.Edinburgh’s Hogmanay is one of their largest festivals and brings in around 75,000 people in order to celebrate the turning of the New Year. Over the course of three days, there are various parties, events, and shows to keep you entertained. We were able to bounce around the city and experience the best of the festivities. Here are the highlights! The night before New Year’s Eve a large gathering of locals and tourists alike come together on the Royal Mile to light the way to the New Year. 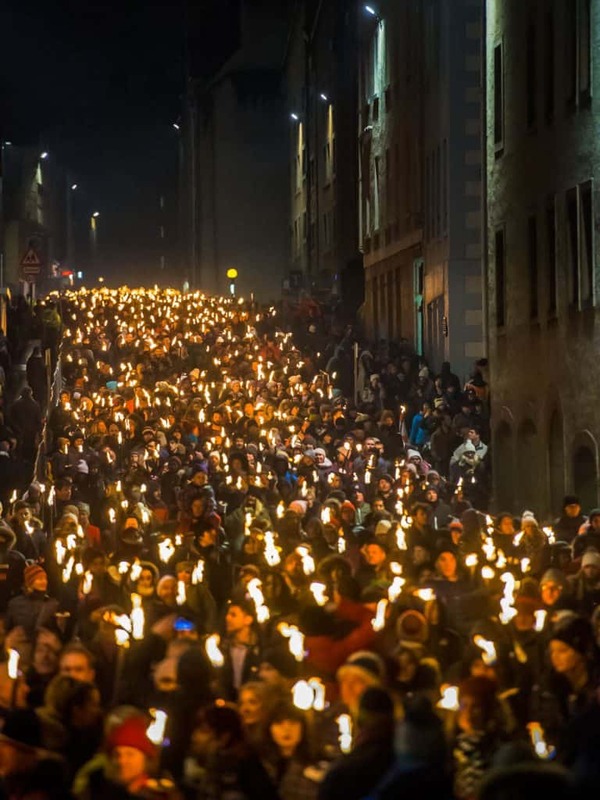 In 2017 nearly 17,000 people filled the streets with torches forming one massively lit parade. 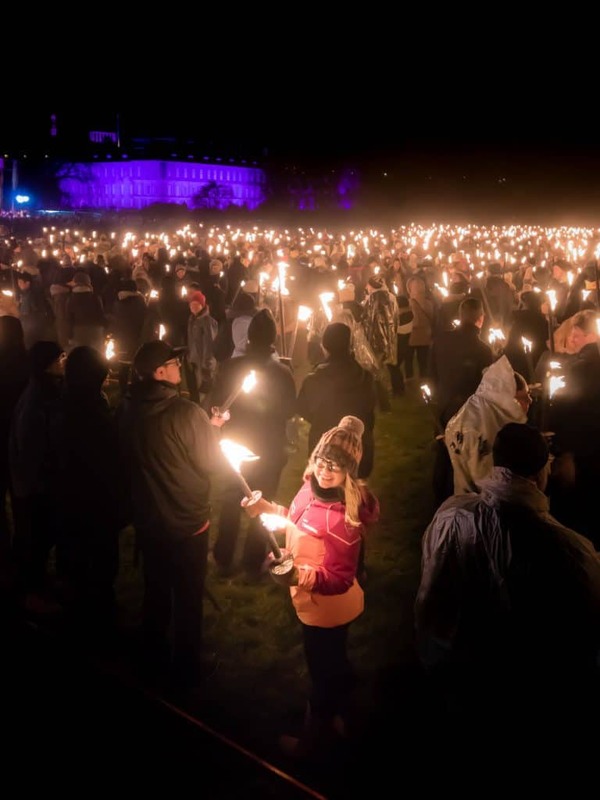 It is a sight to be seen, thousands of torches are lit while bagpipes and drums lead the torchbearers through the ancient streets of Edinburgh. The flames dance and bagpipes echo across the rows of old homes, churches, and cobblestone streets. The procession ends in the Holyrood Park below Arthur’s Seat where a concert unfolds and the torchbearers form a word for the New Year. In 2018 the word is “braw” a Scots word for beautiful or grand as selected by the youth of Scotland. 2018 is the Year of Young People and the Scottish government is giving a voice to the young people of Scotland about the country they wish to see in their future. 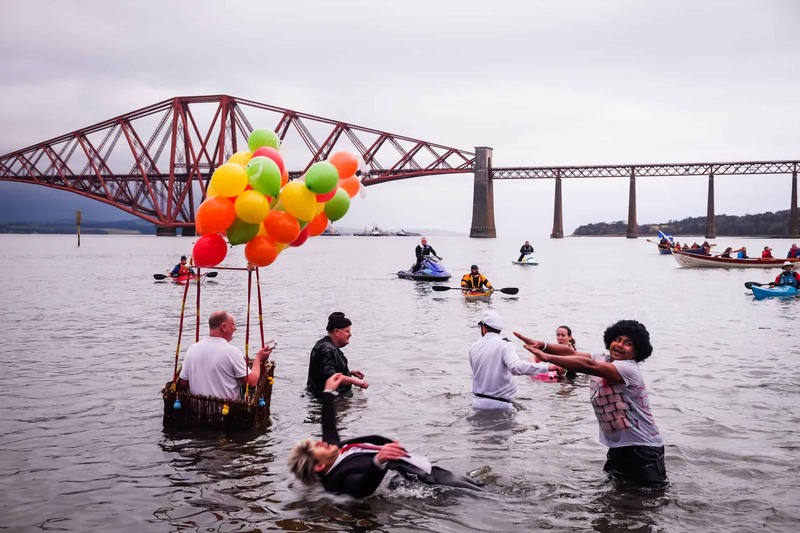 On New Year’s morning, a cast of crazy Scots and tourists head to the Colin Firth to take a dip in the freezing cold waters. 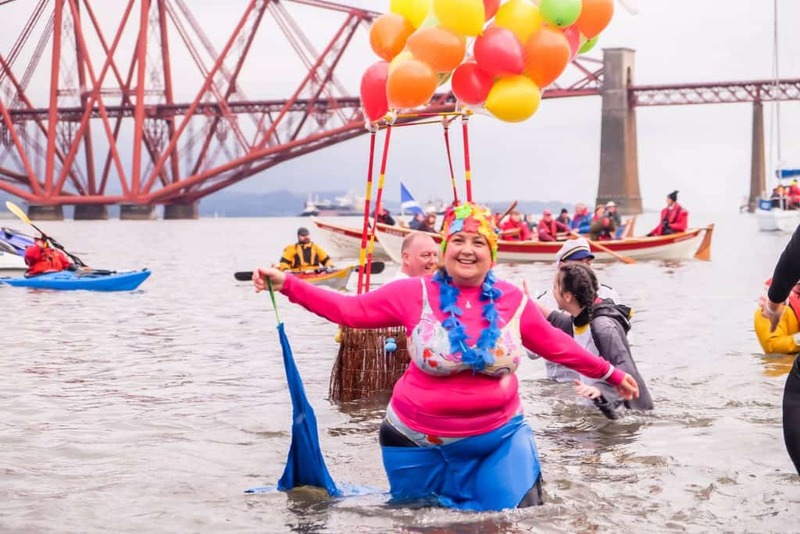 The event takes place in South Queensferry and is a good time for everyone. Everyone shows up in costume in a lively mood, even amidst the hangovers. The parade starts just outside the town and the “Dookers” gather for their triumphant march down to the tidal river. Our favorite costume went to a charismatic pair dressed as Carl and Russel from the Pixar movie Up. They managed to spend an uncountable amount of time in the freezing cold waters coaxing all to join them. We’ll also pretend we didn’t see President Drumpf and his Mexican Wall. No matter the fact that Christmas time has passed the cities wonderful Christmas market stays open until January 7th, or Three Kings Day. It’s easily one of the best Christmas markets in Europe with rides, shops, great food, and plenty of drinks. On the night of the 31st, there are a plethora of private parties in various clubs, restaurants, and pubs. 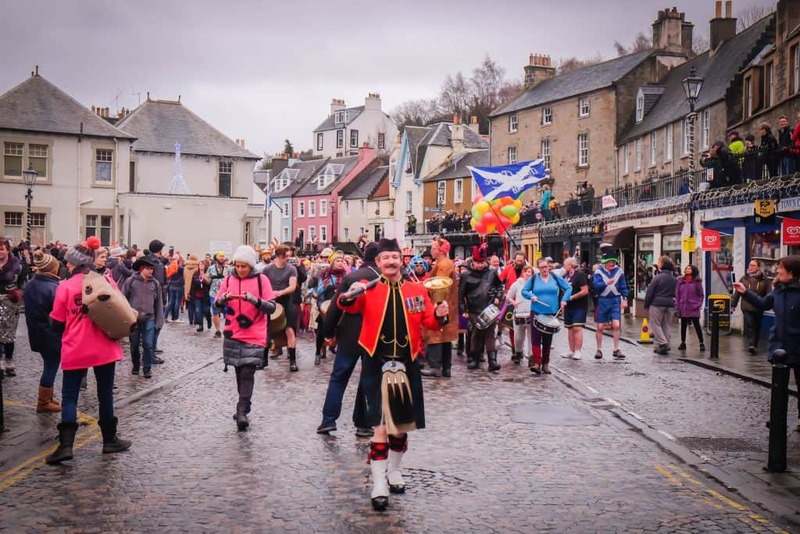 However, the real action takes place in the city streets with a large Cèilidh dance under the castle, a massive street party, and a concert in the gardens. There are performers littered throughout the city and the main street part features four stages of music, shows, and DJs. The street party is the cheapest ticket to the event, inevitably making it the largest of the events. 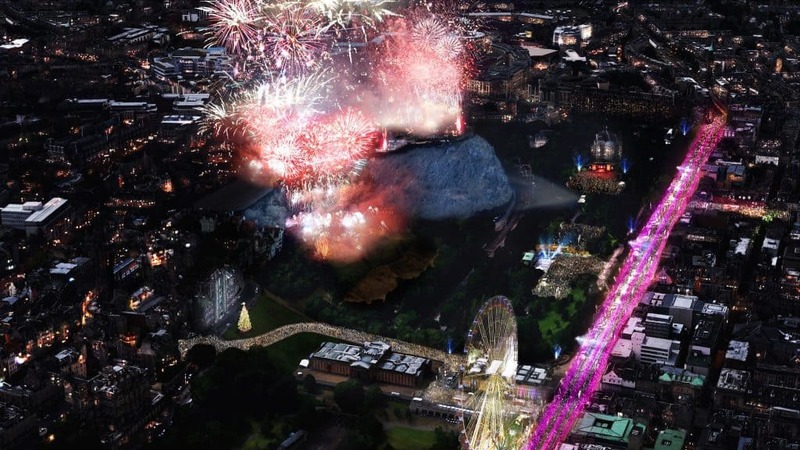 It takes place along Princes Street and provides access to multiple stages with a slew of performers. The artists range from local bands, DJs, and Scottish and international performers. The atmosphere is lively with everyone partying in the streets, dancing, singing, having a good time, and drinking plenty. This is Scotland after all. This is by far the most local atmosphere and if you’re looking to ring in the New Year like a proper Scot this is the spot for you. A Ceilidh is traditional Gaelic dance and concert. It’s a party with bagpipes, fiddles, drums, accordions, and traditional music. It’s a great experience for travelers in Scotland or Ireland to get a feel for local traditions. They play classic songs and dances. It’s great for couples as the dance is done in pairs and with other couples. We had a blast attempting to dance like we were Scottish with festival goers around. There’s no need to worry about knowing the dance steps as the band leader will instruct you in between sets. In Princes street gardens a large stage is erected and draws in a headline act every year. 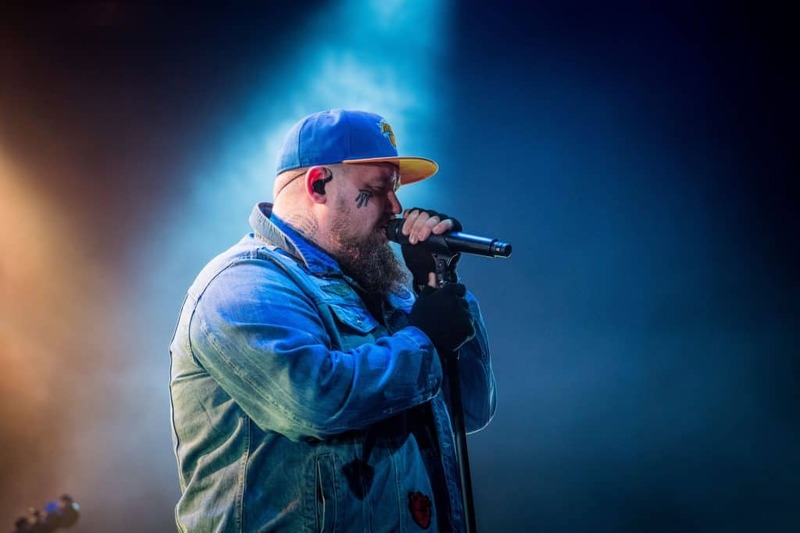 In 2017 the headline act was Rag N’ Bone Man. His massive hit song “Human” hit number two in the U.K. and the music video has nearly 500 millions views on Youtube. Needless to say there was no shortage of fans lining up to see him perform. His performance was amazing and the massive castle at his back did not overshadow his powerful voice. Every year Edinburgh’s Hogmanay manages to snag a great headline artist to lead everyone in Auld Lang Syne. 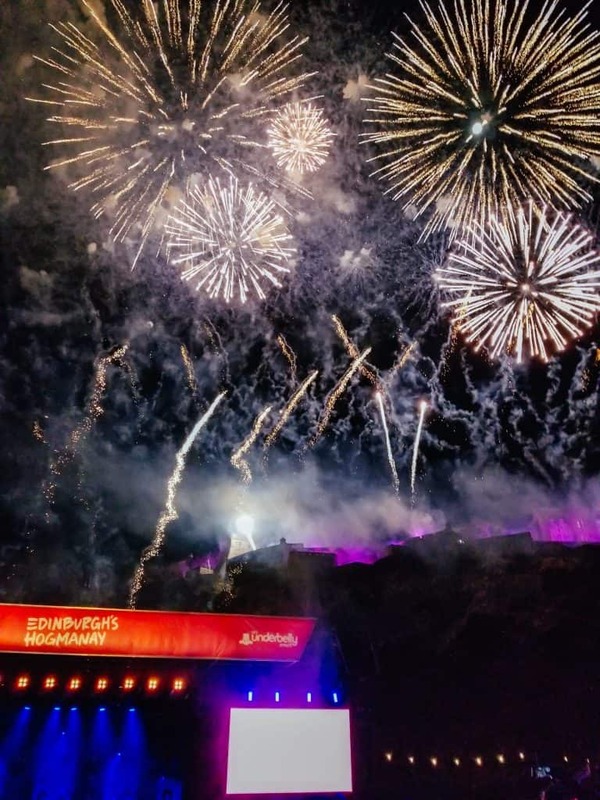 When the clock strikes midnight there is no place better to be than the concert gardens as the castle high above the city displays an amazing (and long) fireworks display. The sky is alight with a dizzying array of fire all set to a score by a local band in Edinburgh. It is by all means one of the best shows either of us have ever seen. You don’t need to take our word for it, just watch the video below. Book your tickets in advance. The most desirable tickets such as the Ceilidh, Concert, and Hogmanay HQ sell out almost every year. 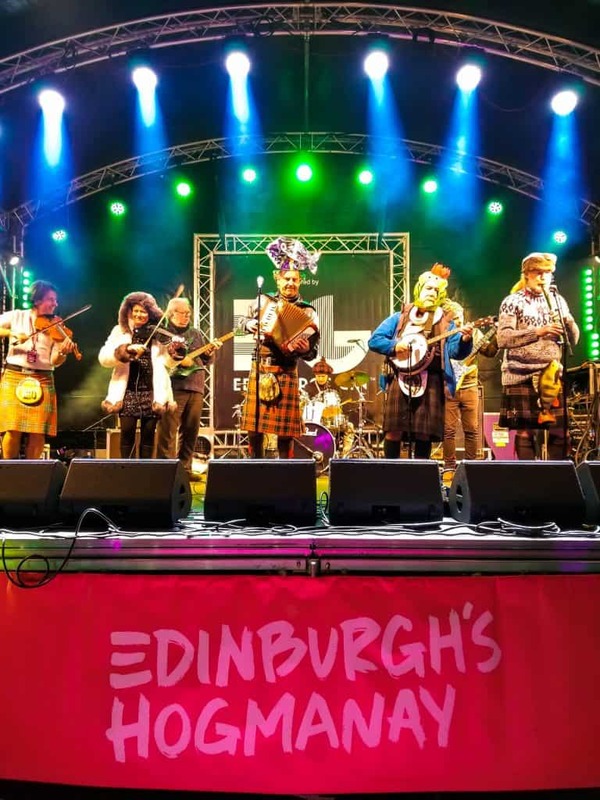 Keep up to date with the Edinburgh Festivals website! Grab a meal before the festivities start. If you’re looking for some great food we’ve been to some of Edinburgh’s best restaurants. You can find food stalls in the street party, but it’s very limited and long lines. As it is the holidays make sure you secure your accommodation well advance, or you’ll be paying a high price for last minute bookings. You can check out our best hotels in Edinburgh here.